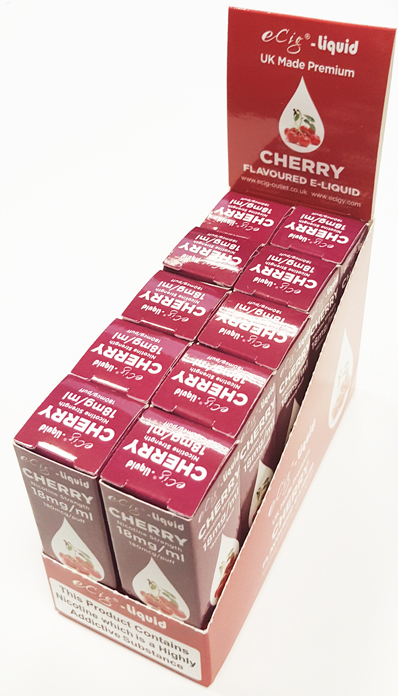 eCig Liquid Cherry E-Liquid. Our E-liquid is a regular strength 18 mg per ml premium E-liquid. It consists of pharmaceutical grade nicotine, propylene glycol and vegetable glycerine in a balanced 50%PG to 50%VG mixture. It works for all types of electronic cigarette, vapourisers, clearomisers, atomisers and battery strengths. Features. Outstanding flavour and vapour from our 50/50 PG/VG mix. No animal extracts. No alcohol. Diacetyl free. Acetyl Propionyl free. Childproof caps. ‘Easy Fill’ tips. Other Information. eCig LiquidTobacco E-Liquid is provided in plastic bottles with industry standard safety information and labels applied and full TPD compliance. The E-liquid bottle comes with a child proof cap (ISO 8317 certified) and small plastic nozzle for easy refilling of your tank or cartridge. eCig Liquid Tobacco flavour E-liquid is manufactured in UK and to our stringent quality standards. We use the highest quality pharmaceutical and/or food grade ingredients all conforming to British and European safety standards. 10 x 10ml bottle of E-liquid.